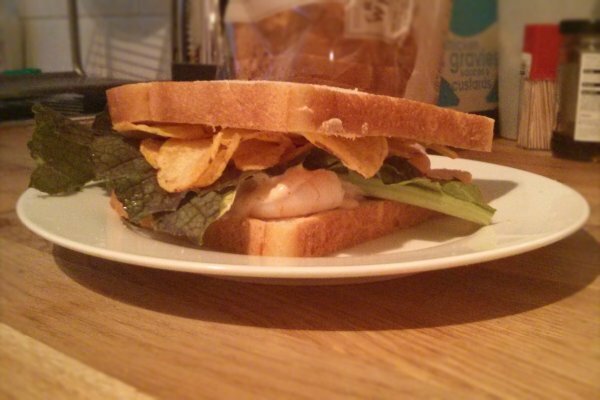 Once upon a time, prawn cocktail was considered the king of sandwich fillings. Prawn cocktail sandwiches took pride of place on buffet tables, M&S chiller cabinets, and - I imagine - eighties power lunches. This is not the case any more. The noble prawn sandwich struggles to compete against today's offerings of jamón serrano and manchego cheese on artisan sourdough, let alone hay-baked swan thigh with foraged woodland herbs and owl's egg mayo on freshly baked pain de campagne. More often than not, you can find a prawn cocktail sandwich, limp and soggy, reduced to 50p in Boots at 7:45pm. But I have never lost faith in the prawn cocktail sandwich, and I think I've found a great way to boost its fortunes. I bring you the double prawn cocktail sandwich. 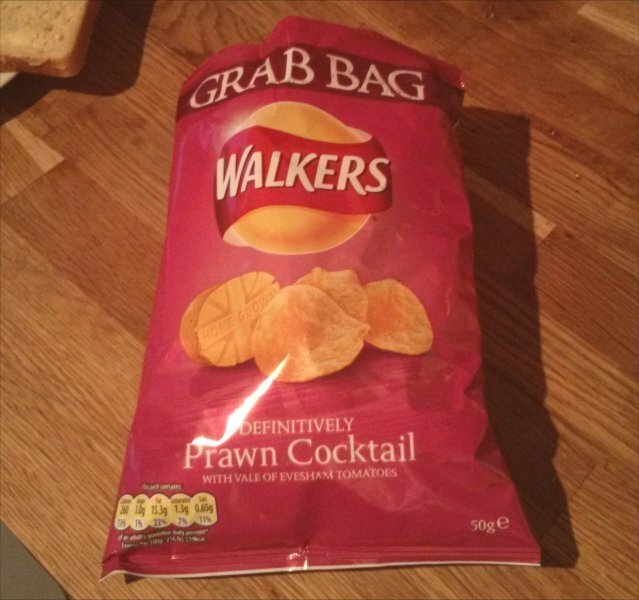 Containing prawn cocktail AND prawn cocktail crisps. Of course, I had to taste a few crisps first, just to check they were up to the high JerryFishbiscuits standards. When the time came to assemble the sandwich, I found that a layer of green stuff was necessary to prevent the crisps from getting soggy (creating "food barriers" is a complex subject which has been touched upon by Mr Noodles here). I wouldn't want anyone thinking that I was going all health conscious. I honestly believe that the 'Double Prawn Cocktail' could become my new sandwich of choice.